Welcome to Our Woodworking Blog! Just like any new hobby, it can be difficult knowing where to start. If you want to be the next Monet, you probably know you need paint and brushes, and maybe some canvas. But what are the tools you need every day to create a masterpiece? What kind of brushes? What kind of paint? The same goes for woodworking. You know you need wood, some power tools to cut the wood, and some supplies to put the pieces together. At Castle USA, we are passionate about woodworking and creating beautiful pieces that are strong and durable. One of our favorite tools is the pocket hole machine, but we’re probably a little biased. Here are some more tools to fill up your shed with. Whether you want to experiment with more detailed projects or want to take on larger carpentry projects, a circular saw is a must have. You can use a handheld saw if you need higher accuracy or a table saw for the larger projects. If you’re just starting out, this tool is easy to use. To put your bookshelves, cabinets, or tables together, you’ll need a drill. Make sure you have a good power drill and a good range of drill bits to fit different needs. To start out, consider going with a cordless drill as they are less expensive. As you get to know your woodworking schedule and habits, you can upgrade to a corded drill. Just keep in mind that you’ll have to charge the battery as needed. 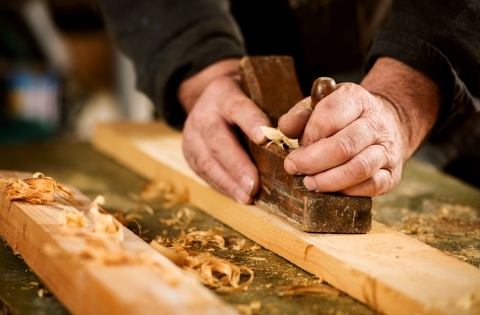 Even in this world of technology, you’ll need some basic woodworking tools in your shop. A handsaw, whether it’s a rip or crosscut panel saw, can help you make rough dimensions. A rip saw cuts along the grain, a crosscut saw is similar to a knife. There are also back saws, which are used for more detailed work. Varieties include dovetail, carcass, and tenon. Who knew there were so many types of saws? Most people aren’t getting into woodworking for a workout, so it’s OK to invest in an electric sander. There are three main types: orbital, random, and belt. There is a chance that the orbital sander will leave marks on the wood when it has been sanded too much. A random sander will lessen this risk. A belt sander is great for larger projects because it has a lot of force. Every carpenter or woodworking hobbyist needs a set of chisels, regardless of what you’re making. Start with a set that has plastic handles, which will make it more comfortable to hold as you get to know how to handle the tool. You can eventually upgrade to a set with beveled edges. Yes, there are many woodworking tools that are power tools. The block plane has a variety of uses, including chamfering, cornering, smoothing end grain cuts, and even cleaning up marks on the wood left from sawing. Meant for cutting out curved or circular patterns and straight lines alike, the jigsaw is an essential tool to start with. As you become more familiar with woodworking techniques, you’ll feel more and more comfortable with the tool, but they are fairly easy to work with in general. They are easier to maneuver than a handheld table saw and you can start the cut in the middle of the board. As you’ll soon find out, there are many different joints that can be used in woodworking. One of them is the pocket hole joint. While there are machines that can handle this job, the Castle pocket hole machine stands out from the rest. This machine will give you a clean, smooth cut and the low-angle pocket achieves a shift free process and increases the strength of the joint. With Castle USA and our pocket cutter machines, you’ll enjoy an efficient pocket cutting process so you can build better pieces. We have a variety of pocket hole machines, including the Castle 100, the TSM-22, TSM-35, and more. All of the machines come with various features and benefits, but all of them give you the same beautiful result. The Castle 100 is especially easy to use and can be taken to your project, instead of having to bring your project to the machine. Learn more about the pocket hole machines we have to offer and stock up on drill and router bits, wood blocks, and so much more.